When the world’s best in their fields are mentioned, Kevin De Bruyne would surely answer aye. The Belgian footballer is a stand out star and has shown this by his many efforts in assisting his team whether on the national front or internationally that he is indispensable. He plays as a midfielder for the English club, Manchester City, and the Belgian national team. Kevin was born on June 28, 1991, in Drongen, Ghent, Belgium. His father is Herwig De Bruyne and his mother, Anna De Bruyne, a petroleum engineer, although a white, she was born in Burundi. From her birthplace, she moved to Ivory Coast and then to Ealing where she spent the majority of her childhood. Kevin De Bruyne has a sister called Stefanie De Bruyne. His playing style is like no other and he has been recognized for its uniqueness. In 2017, Kevin was ranked world’s fourth-best footballer by The Guardians. He has also been dubbed a complete footballer often and in other times, the Man of the Match. His colleagues, coaches and the media alike are not left out in the accolade awarding. They have ranked him among the best players in Europe on more than one occasion. A brief look at his career timeline will let us in on what a great player he is. The dream of every young boy who loves the game of football is not just to play one day, but possibly be a player of international repute. The midfielder’s dream wasn’t any different. He started his career in 2003 at the age of 12 in his hometown club KVV. In his second year, he joined the Belgian football, track, and field hockey club, known as Gent but would change camp the same year to Genk in 2005. Within a short time of training, Kevin showed by his progress that he is a prodigy and an asset to be kept. He was promoted to the first team squad in 2008. After more than 7 years in the club, he transferred to Chelsea in 2012. He signed a five-and-a-half-year contract at Stamford Bridge for a fee speculated to be around £7 million. Seeing his new base as a dream come true, he worked hard to achieve his desired success therein. With his stock rising rather fast, it wasn’t surprising to have the big names in football clubs flocking around to have him in their fold. He was loaned for a season to Werder Bremen in the Bundesliga. He continued his good form and scored a number of goals for the club most of which scored them coveted victories in a number of games. Kevin made his return to Chelsea on July 1, 2013. He was transferred to Wolfsburg in 2014 for a signing fee of £18 million (€22 million). Being a seasoned player, he set a new Bundesliga record by ending a season with 21 goal assists. His club by that feat also finished second in the Bundesliga and qualified for the 2015–16 UEFA Champions League. Kevin De Bruyne signed a six-year contract with the English club, Manchester City. The deal was signed for a fee of £55 million making him the second most expensive transfer in British football history after Ángel Di María‘s move to Manchester United in 2014. He scored the winning goal against Paris Saint-Germain which advanced his club to the 2016 Champions League semi-finals, for the first time in the club’s history. Following his numerous milestones in his career, he has established himself as one of the world’s top talents. He signed a new contract with Manchester City in January 2018, keeping him at the club until 2023. Read up on his life outside the pitch. The City midfielder is married to a blonde beauty, Michele Lacroix. They met in 2014 when he was playing for Wolfsburg in the Bundesliga. He moved to the Premier League club after he found out that his then-girlfriend (now wife) was pregnant, having said earlier that if he has to move, it would be because it is a good choice for him and his family. Kevin signed the deal with Manchester City in the company of his wife. 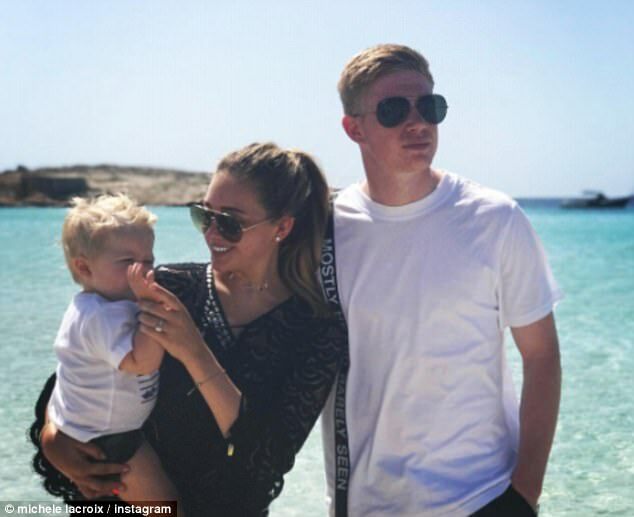 Their son, Mason Milian De Bruyne was born on 10 March 2016 and they tied the knots in June 2017 in Italy, after their 2016 engagement at the foot of the city of love’s (Paris) Eifel Tower. Kevin De Bruyne like most athletes has had a relationship in the past before he settled with his wife. It was with Caroline Lijnen whom he dated for three years. However, the union could not continue because of infidelity on the path of the girl. It was reported that Caroline cheated with Thibaut Courtois, Kevin’s international teammate with Belgium. The discovery created a rift between the two although they are good now. Caroline alleged that her actions were to get even with Kevin who started the infidelity game first. She claimed that he slept with her old best friend in 2012. He is an invaluable player. Kevin has formed part of the revolution in his national team and promoted his club to the forefront. Consequently, his earning should say more about his value and outputs. Through the many contracts he has scored, his salary would be in the range of that of the world’s best players. His contract with City until 2023 earns him a salary worth around £115,000 a week. However, with the renewal of the deal in early 2018, it would worth around £210,000 per week. Going by his whopping salary and sponsorships, his net worth is estimated to be around $30 million. The stand out footballer in the nature of athletes has a well-built body with matching stats. He is 1.81 m (5’11”) tall and his body weight is 68 kg (150 lbs). Kevin De Bruyne is nicknamed tumble dryer because of his dry sense of humor and ability to maintain a cool demeanor. He made his international debut in 2010 and has earned over 50 caps (appearances) for his home country, Belgium. His mom’s nationality makes him eligible to play for the Burundi team although he would have played for England when it was thought that the mother was a native. The playmaker is multilingual and is fluent in Dutch, French, German and English. Kevin bought his first car, a Mercedes in 2015 in preparation for the birth of his first child. In an interview he gave when he was a child, the star said that Liverpool was his favorite team. He was named the 2015 Footballer of the Year in Germany after an impressive record, 16 goals and 21 assists, at the end of his breakout season. The midfielder was part of his national team that reached the quarter-finals of the 2014 FIFA World Cup and UEFA Euro 2016. His autobiography, Keep It Simple which was co-authored by Raoul de Groote, was published in October 2014. Kevin is an avid conservationist and spends most of his free time walking in the country and observing the wildlife. He was appointed as the ambassador of the Weltvogelpark bird sanctuary, Walsrode, Germany in August 2014. Like most athletes, who have the knack to translate their successes into a profitable venture such as Cristiano Ronaldo‘s CR7, Zlatan Ibrahimovic‘s A-Z, and Rio Ferdinand’s FIVE Supply, Kevin has his own clothing line named KDB. It is a pop-up clothing line in partnership with the firm Cult Eleven. He has been an ambassador of Special Olympics since 2014 and sends part of the profits from his clothing line there.